CLICK ON THE “PLAY” BUTTON ABOVE TO SEE THE VIDEO! One of our engaging 3D animated kids fun videos with a song-story about cute animals with personality who visit and say “hello” in different languages – Bonjour, Ohayo, Kia Ora or Hola, Ni hao and G’Day. But they are put into funny places around the house until there’s no room for the family so there’s a surprise ending! Great for children 0 to 7 years and the characters do the actions for the Toodle dance! Ideal for developing co-ordination in little ones and following cues by copying the actions. And it’s very much a singalong song! Choose from 2 videos – Australia/New Zealand version or outside Australia/N.Z. (great for U.S., South America, U.K., Europe, Asia, etc.). In the Australian/New Zealand version the sheep says “Kia Ora” and in the international version the sheep says “Hola”! Also available for both versions are the sing-along videos which display the lyrics on-screen. You can choose! Prefer it ad free and available to play anytime offline? This small cost purchase will enable you to do that! And you support children in need at the same time because the proceeds from your purchase go to the Rainbows and Sunshine community book donation program. 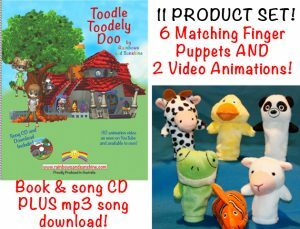 There are now lots of matching products for this fun song – a just-released book with CD and downloadable mp3 song ($24.90), the 4 videos (2 have singalong lyrics onscreen) at $3.90 each, a set of 6 finger puppets to match the animals characters in the song/story) $19.90, and the complete matching set with all 11 matching products for $49.90 which is a perfect gift for little songsters! Below is a preview of the 24 page book which shows some inside pages and details, followed by a preview of another Rainbows and Sunshine book called “Black and White Cow”. Below are details of the 11 Product Toodle set…. check out “Black and White Cow” which also has a 6 product matching set (under the menu Books and Toys)!